This is a great quote for any way you are trying to teach a child. Whether it be sports, school, morals, or discipline, involving the child is what helps solidify real understanding. This is one reason the principle of Ask and Tell is so powerful. This principle involves the children in the process of what you are trying to teach them, so it helps them remember. You can tell your child how to do something and you can show your child, but the real way to get your child to really understand how to do those things is to just let the child do it (though you want to have adequate teaching and showing before handing the reins over). As you are teaching your children whatever it is you are teaching, keep this idea in mind. 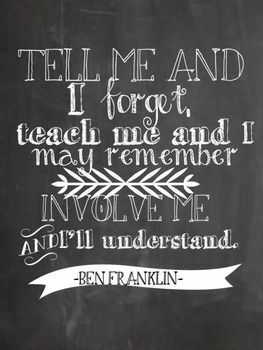 Figure out how you can involve your child in the learning process.